There's more to the Canary Islands than the sun, sand and fun of the big beach resort towns. And not just the sailing, surfing, snorkelling, diving and volcano walks. There is a rich tapestry of local life going on. As well as working for the tourists, these islanders are also working for themselves, farming all sorts of fruits, vegetables and flowers and contributing to the beauty of the varied landscape. The majority of our recommendations for the best places to stay in the Canary Islands will not be found in the big resorts, instead we concentrate on properties that can give you a real feel for life on these isles. Yes, the beaches are gorgeous and sun-drenched, but some of the main sights of the Canary Islands are their national parks with their dramatic, moonlike volcanic landscapes. Largest of the Canaries, Gran Canaria is often referred to as a 'continent in miniature'. The terrain varies from the verdant north, via the dramatic mountain peaks of the interior, to the dry south. And of course the alternating white, sandy coves and dark cliffs of the coastline. It's not just the terrain that's varied, Gran Canaria has something to offer travellers searching for their own fresh experiences, as well as package holidaymakers. Las Palmas is the capital, and one of the best places to stay if you thrive in a hive of activity. This is Spain's seventh largest city - so also a great destination if you fancy a sunny city break - but because of its island position it's has a North African flavour. The older part of town, Vegueta, is a good bet if you're looking for somewhere with atmosphere. The good news about Lanzarote is that the burger and beer brigade voluntarily incarcerate themselves inside three ghastly resorts - and never leave. Which means the rest of this exquisite island – with its 300 volcanoes, lunar lava landscapes, vineyards, fish restaurants, world-class surfing, whitewashed villages and obligatory old men with donkeys – is completely unspoiled. With England’s independent travellers still stuck with nightmarish visions of "Lanza-grotty", the canny Spanish and Germans can’t believe their luck. Tenerife's reliably sunshine-drenched shores attract around ten million visitors each year. And while this island was once dominated by beach-perfect package holiday resorts, visitors are now beginning to take an interest in the dramatic volcanic landscape of the interior and the more traditional Canarian experience found away from the tourist resorts.If you're here for the beaches and you want to avoid the crowds, some of the best places to stay are El Medáno, on the south-east coast of Tenerife, and Los Gigantes on the western coast. La Palma is the lushest and greenest Canary Island. Unlike the larger Canaries, La Palma's economy isn't tied to tourism. It's a fertile place, especially for growing bananas, and the farmers don't need the fuss of tourist high-rises. If you're looking for a quiet, sunny escape - in summer or winter - this island is for you. Fuerteventura is closer to Africa than its neighbours and its colourful towns and volcanic-ridged landscape get plenty of sunshine. Most people are just interested in the beaches, arguably some of the biggest and best in the Canary Islands. Fuerteventura’s beaches aren’t just lauded by sun and sand lovers though, these are blustery wonderlands much loved by anyone who likes their waters wind-whipped. If your idea of the best location on Fuerteventura is more remote, then this UNESCO biosphere reserve won’t disappoint - some of it is very developed and some is completely untouched. One of the smallest Canary Islands, La Gomera is so different from its bigger siblings as to be almost unrecognisable. Instead of resort lined beaches and beach lined resorts, those alighting from the hydrofoil on La Gomera find themselves amongst banana plantations and ancient laurel forests. The island is backed by the steep volcano which sits in the centre of the island. El Hierro is another tiny Canary, a volcanic, cliff-lined dot in the middle of the Atlantic. If you’re looking for remote this is the place to come, it’s definitely got a sense of being the edge of the world, which is just what it’s best known for. Visit the Timanfaya National Park on Lanzarote. Created by multiple volcanic eruptions in the 1700s, it boasts a stunning lunar landscape and is home to many rare plant species. A coach tour of the volcanoes is included in your entry fee and there are a couple of guided walking opportunites (you'll need to book ahead for these). Maspalomas Sand Dunes on Gran Canaria has been a protected area since 1897 and it's not hard to see why. They area a vast, awesome sight and can be easily explored along the many way-marked trails. But don't forget your flip-flops, the sand gets incredibly hot even in winter months. Go for a dip at Charco Azul (blue lagoon) on El Hierro. This beautiful natural pool can be found at the bottom of a cliff, below a basalt rock arch. It will take your breath away! Spend a day strolling the streets of San Cristobal de la Laguna, a UNESCO World Heritage Site, on Tenerife. There is masses to see, plus the bonus of a beach for cooling off from time to time. Santa Cruz de La Palma (on La Palma) is another place worth spending time in. It's a gorgeous old colonial town filled with palaces, churches and original buildings all in traditional Canarian style. With so many different places available finding one of the best places to stay in the Canary Islands shouldn't be a problem whatever your fancy. This is a popular destination however, so do plan ahead and make your booking early. The sprawling Villa Cortes in Playa de las Américas has all you could want for a luxury beach holiday with six restaurants, four bars, a spa, private cabanas, richly furnished rooms and a vast pool with waterfalls. Hotel Gran Rey is located right on the beachfront in the heart of Valle Gran Rey. Offering comfortable rooms with splendid ocean views, you can enjoy a refreshing dip in either of their two pools and tuck into traditionally Canarian cuisine at the restaurant. The ideal coastal getaway without breaking the bank! 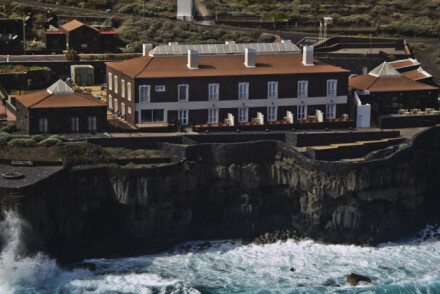 The 45 room Parador de El Hierro has an edge of the world feel on tiny El Hierro. You get the amazing Atlantic views, and calm water right in front of you right on the beach. Close to the beach on the east coast of Fuerteventura, Barcelo Castillo Beach Resort offers excellent water sports, three pools, al fresco dining and crisp, contemporary rooms and suites. The magnificent Princess Yaiza Suite Resort Hotel, at Playa Blanca, offers five-star luxury from the balconied contemporary-style rooms and eight restaurants to the large spa, sports facilities and six pools. 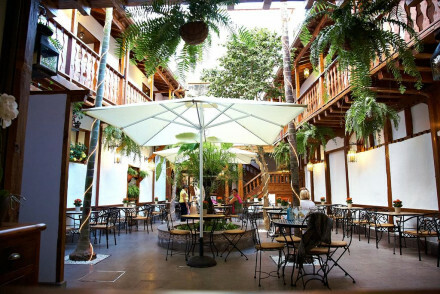 Take a look at Tenerife’s Hotel San Roque if you want something relaxing and out of the way. The hotel started life in the 18th Century as a palace, so you're not short on home comforts or luxury. And the fishing village of Garachico, where it's located, offers both the seaside pleasures of water sports and sunbathing, and the pleasures of the mountains and nature reserves. 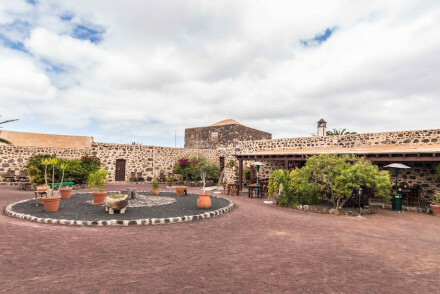 The Hacienda del Conde is located off the beaten track on the western end of Tenerife's North Coast. It boasts luxurious accommodation, choice of restaurants, two swimming pools, extensive spa and a superb Seve Ballesteros designed golf course! For a rustic and traditional 'escape to the hills', one of the best places to stay on the Canary Islands is Gran Canaria’s Hotel Rural Las Calas. With plenty of local mountain trails to explore - on foot, on two wheels, or on horseback - this is a great place for a sun-drenched outdoorsy break. 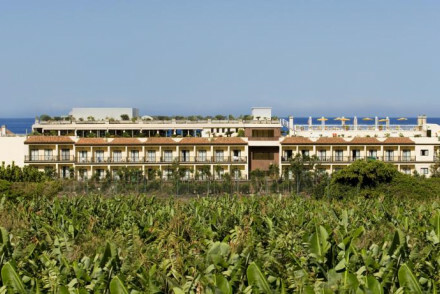 The Hotel Rural Las Calas is also well positioned for local produce markets in San Mateao. 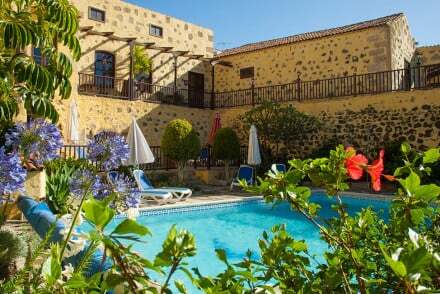 La Gomera’s Hotel Rural Ibo Alfaro is a traditional property boasting breathtaking valley views. Featuring 17 charming and individually decorated rooms, it's perfect for those wanting to head off hiking during the day whilst you can also rent a bike to explore more of the area. In a quiet setting on the Costa Adeje, Royal Gardens Villas & Spa offers hideaway-luxury, with romantic villas decorated in Balinese style and with private pools. An excellent restaurant and spa, too. 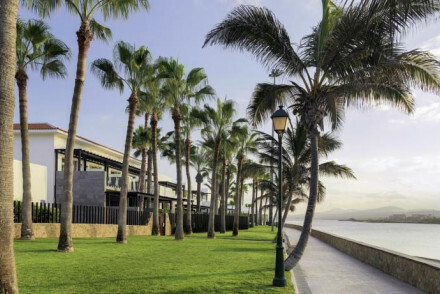 With its infinity pool, beachfront position and butler service, you will want for very little at Tenerife’s adults-only Red Level Gran Melia Palacio de Isora. Rooms are chic and stylish in white-on-white, some with private pools. The Avanti Boutique Hotel in Corralejo is an urban chic hotel with light, modern white washed walls and beautiful private sun decks overlooking the Atlantic. There are just 15 rooms, a restaurant, bar and a hot tub. Strictly adults only, but tranquil and intimate with it. Parador de la Gomera, a chicly converted manor house, is one of the best places to stay on La Gomera if you want to be in San Sebastian. Traditional, with stunning clifftop views, this hotel has plenty of Canary character. Casa de Hilario will suit if you're looking for a home-from-home feel. This was once the home of one of Lanzarote's first settlers, but these days the whitewashed walls contain seven beautiful, and individually painted and decorated rooms. All arranged around a central courtyard with a small pool. Comfortable and bright, this is a great place to come with your family or with a group. Tenerife’s Sandos San Blas Nature Resort & Golf is perfect for families and golf lovers. There's masses of activities on offer from kayaking and boating on its own lake to yoga, tennis and much more. Golf is on a choice of two world class courses next door. With a private beach, lush tropical gardens, Disney-style architecture, plus a choice of rooms, suites and individual villas, Bahia del Duque is a real fantasy getaway. Every whim can be met - and children will love the games room and water sports. The relaxed La Casona del Patio, a restored 17th-century manor house near Masca in Tenerife’s rural north-west and close to the Teno Mountains, has rustic rooms, plenty of space for energetic kids, and a special children’s menu in the seafood restaurant. Tumbling down a coastal cliff, well away from Tenerife’s crowds, the Ritz Carlton Abama is a sprawling, Moorish-styled resort-hotel with a choice of ten restaurants (one with a Michelin star), contemporary rooms, championship golf course, spa and gym, and a private beach. In a perfect location in the mountains near Teide National Park, the rooms - most with balconies - at Hotel Villalba enjoy stunning views. Rooms are unpretentious, plus there’s an indoor pool. Parador de las Canadas del Teide is the only hotel located within the national park. It boasts jaw-dropping views, traditionally elegant rooms and an excellent restaurant. 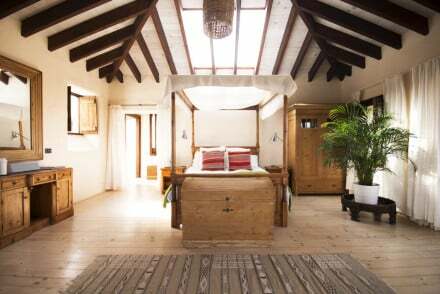 Fuerteventura’s Mahoh, a 19th century traditionally Canarian house, offers accommodation with antique beds and exposed brick walls at excellent value. Set amidst the mountains, it's surrounded by a number of wonderful walking trails and also boasts its own tennis court. 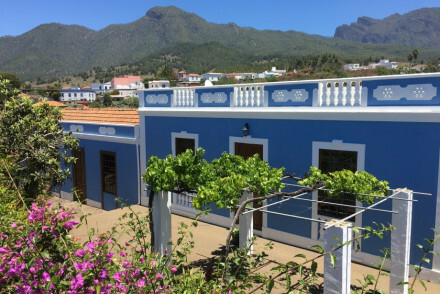 With rooms starting at just £57 per night, the Caserío de Mozaga, a family friendly finca, is one of the best places to stay in the Canary Islands for families with smaller budgets. The eight rooms are pleasant and whitewashed, decorated with antiques, and the restaurant is lively and fun. There's no pool, which is why it's probably so reasonably priced, but the Lanzarote location is excellent. Hotel el Patio is a stunning old manor house turned hotel that is situated close to the beach and is surrounded by Tenerife’s nature reserves. It's great value with doubles starting from as little as £80 per night. If you're travelling with a group of friends or extended family, you might prefer a self catering property. Our online partner Booking.com, has a wide range from beautiful villas with pools to beachside apartments. All seven Canary Islands have airports. Including five international airports. Tenerife has two: Tenerife North, formerly Los Rodeos, in the north and Tenerife South, formerly Reina Sofia, in the south. Gran Canaria has Las Palmas de Gran Canaria Airport, 16kilometres outside Las Palmas. Fuerteventura Airport is served by all major airlines and situated 3 miles southwest of the capital, Puerto del Rosario, and Lanzarote, Arrecife airport serves Lanzarote. If you want to hire a car we recommend you visit our online partner Rentalcars. Sunny and warm for almost 365 days of each year, the Canaries’ subtropical climate is one of the reasons these islands are such a popular destination. You can still swim in the ocean during December and January and there’s still blue skies and mild weather. Because of this the busiest season is between November and March. Summer is the other peak time, with many beach-holidaymakers arriving for some bucket and spade fun in the sun. Charming collection of four self catering cottages in the pretty town of San Miguel. Interiors are elegant and cottages are very well equipped. Communal garden with saltwater pool, barbecue area and terraces for sun bathing or dining. A quiet getaway with easy access to all Tenerife's best bits. Local exploring - La Bodega is ideally located for exploring both beaches and inland Tenerife. A charming small hotel set in the heart of the historic old town of Icod de los Vinos. Housing just eight traditionally dressed rooms, the best of which face around the central courtyard. An authentic base to explore the island from. Local exploring - Ideally positioned to explore the town on foot. Sights nearby - Visit the 16th century Church of San Marcos and admire the carvings and relics. Great walks - Take long walks in the picturesque surrounding countryside. Cheerful, traditional B&B in the small village of Tinajo. The traditional rooms are spacious and comfortable and from the communal terrace there are great mountain views. Take a day trip to Timanfaya National Park or hire a bicycle and go to La Santa. An excellent low budget option. Great walks - Excellent walking trails in the Montañas de Fuego Mountains. Sights nearby - Visit the Campesino Monument. Laid-back B&B on organic farm. Housed in 17th century building, the rooms feature beamed ceiling, wooden floors, rustic furniture and white bathrooms with stunning views. Outdoor plunge pool, terrace and gardens leading to the organic farm. Peaceful, private and very pretty. 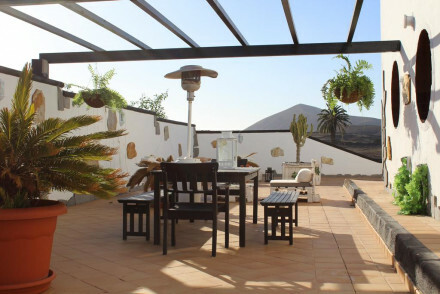 A delightful guesthouse just a short stroll from the beach in Las Palmas de Gran Canaria. The simple elegant rooms are appointed with tasteful furniture and mood lighting - a word of warning, not all are ensuite. Perfect launchpad for exploring the city and surrounding coastline. A great value spot. Value chic - A great value option for exploring Las Palmas de Gran Canaria in style, with chic suites, excellent breakfast and low costs! Local markets - Browse through the nearby mercado central and pick up a few things to bring home with you! Great walks - There are loads of lovely walks running through the Parque Romano. A gorgeous little guesthouse in Vegueta close to the beach. Romantic rustic rooms have white washed walls and boutique decoration. 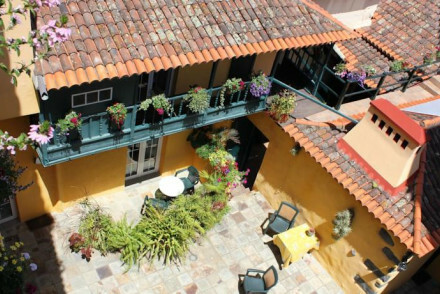 Lovely inner courtyard, walking distance to the restaurants, and excellent value. A romantic spot for a beach holiday. Mahoh is a traditional 19th century Canarian house, awash with heritage and charm. The rooms are dominated by great antique beds and are given added character from their exposed stone walls. Sample typical Canarian food at the hotel's restaurant. A delighful, low-cost option. Country Escape - Tucked away in the countryside, away from all the mega seaside resorts, with stunning views of the mountains. Great walks - This rugged landscape offers great walking, especially the nearby Malpais de la Arena. Sights nearby - Visit the charming fishing town of El Cotillo, six miles from the hotel. An excellent seaside resort on the east coast of Fuerteventura. Brimming with facilities, the hotel has plush rooms, several restaurants, three swimming pools and an onsite theatre. Packed with activities and large suites, it's perfect for a family holiday to Fuerteventura. Families - Packed with sports facilities, as well as a kids club and large family rooms it's a perfect getaway for all the family. Beach Life - Just two minutes walk from the beach, with access to a whole load of watersports facilities. Fishing - Fishing trips can be organised by the hotel and are a great way to explore the coast. A traditional property commanding epic views of the Hermigua valley. Each of the 17 individually styled rooms has its own charm; think quaint prints, antique furniture and original features. The perfect spot to start out on a days hiking. Ideal for those in search of complete tranquility. Country Escape - This rural retreat offers startling views from rooms and terraces, and there is plenty of gorgeous countryside to be explored. Sights nearby - Wander through the historic village of Hermigua and be sure to visit the remarkable "Santo Domingo" church. Great walks - Discover the picturesque surrounding valley on long rambling walks. 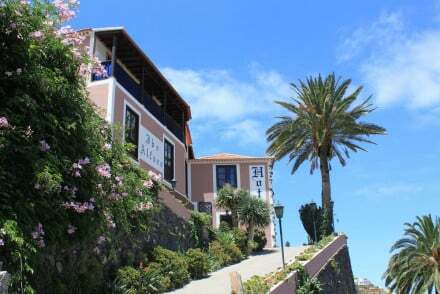 Hugging the west coast shoreline of La Gomera, Hotel Gran Rey exudes serenity and tranquility. With stunning ocean views, comfortable rooms and two swimming pools, it's perfect for a romantic break. Enjoy cocktails at the pool bar and delicious Canarian cuisine. A soothing, seaside gem. Local exploring - Located right on the beachfront, it's perfect for exploring the sleepy town of La Puntilla and the surrounding coastline. Great walks - Make the most of the great walking trails in the nearby Parque Nacional de Garajonay. Local markets - Explore the local market at La Puntilla, and pick up some yummy regional treats. Fishing - Fishing trips can be organised at La Puntilla harbour. A charming little B&B in rural La Palma. Three chic bedrooms offer a stylish blend of traditional features with a contemporary feel - think exposed beams, antique tiled floors and large, modern four poster beds. A pretty little garden with heated pool is the icing on the cake. An intimate hideaway. Value chic - With lovely rooms from just €90 per night including breakfast, this is excellent value. Local exploring - Ideally located for exploring the island and close to some of its best walking country. 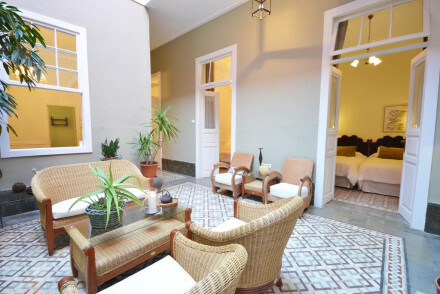 A superb boutique hotel nestled into the historic old quarter of Santa Cruz de La Palma. Set in a wonderfully restored 17th century building, the rooms are spacious and comfortable with ocean facing balconies. Perfect for a romantic, relaxing break. 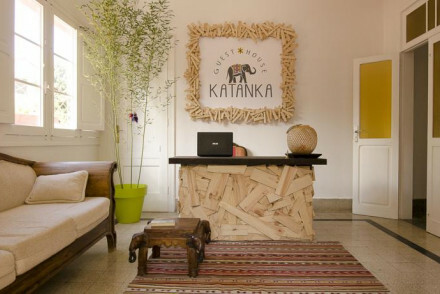 Local exploring - A small boutique hotel, perfectly placed for exploring the colonial history of Santa Cruz de La Palma. Local markets - Explore the local markets of Santa Cruz de La Palma and pick up some treats to bring home with you. Sailing - The ideal port of call for a sailing trip around La Palma. Sights nearby - Three miles from the fantastic Observatorio Astrofísico. With the raw energy of the ocean crashing into the nearby cliffs, it's an atmospheric spot for a modern hotel on El Hierro. The rooms are pleasant and spacious, affording great sea views. Relax in the spa or recline by one of the pools. Perfect for people looking for that edge of the world feel. Hideaway - With an end-of-the-world feel, it's perfect for a hideaway holiday on a cliff edge! Local exploring - The ideal base for exploring the remote and untrodden island of El Hierro. Great walks - Make the most of the stunning walks along the surrounding cliff coastline. Birdwatching - Great for observing El Hierro's cliff bird population. 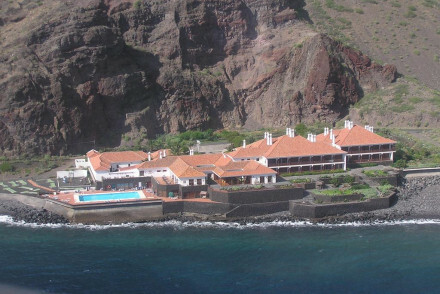 Parador de El Hierro is a spectacular hotel with an unmistakable edge of the world feel. The rooms are spacious and comfortable with many boasting superb views over the Atlantic. Explore the quiet beauty of the island or simply relax on the beach. The perfect hideaway. Hideaway - Set directly on a beach at the foot of cliffs, is this perfect hideaway spot, on an island once considered the end of the world. Total relaxation - Unwind on this tiny, tropical island of El Hierro, with sauna, hot tubs and massages available. Diving - Diving can be arranged by the hotel and is a great way to explore the island from another perspective! Great walks - Guests will love exploring the rugged coastline, or wandering towards the mountains.